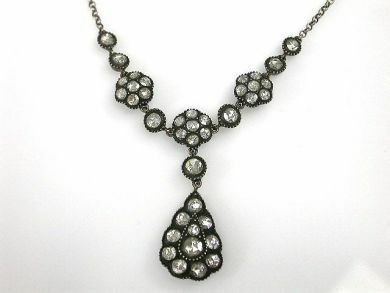 One antique silver diamond necklace. Eight rose cut diamonds (0.63 carats: VS-SI clarity: I-J-K colour). Thirty-one rose cut diamonds (1.34 carats: SI-I1 clarity: I-J-K colour). The necklace is 17.5'' in length.